Hi everyone! I hope everyone had a wonderful weekend. We sure did because the weather has been unseasonably cooler with a hint of fall in the air. I thought I’d give you an update on how our white pumpkins are growing. You know, white pumpkins have gotten really popular in decorating but they can be quite expensive and hard to find. So Leo and I decided that we’d try growing our own since we had the space. That’s the very first thing you’re going to need it you plan to grow some yourself. We planted our seeds mid-July to allow enough growing time. 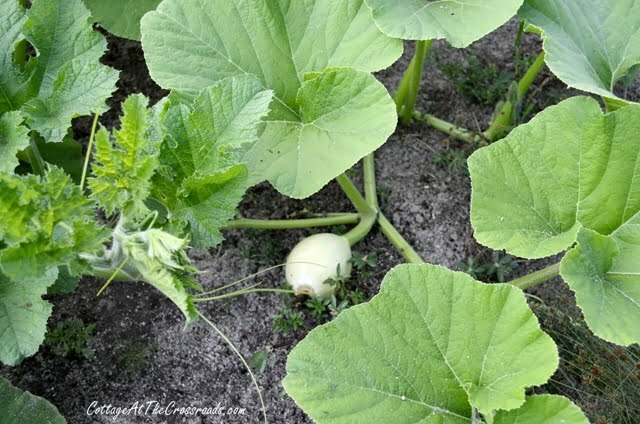 Pumpkins need about 90-100 days to reach maturity. 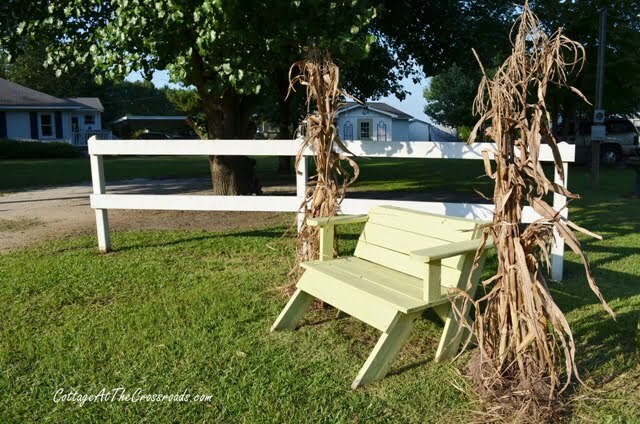 You can read more about how Leo prepared this area for planting in his post White Pumpkins for Fall, Anyone? We planted 3 different varieties of white pumpkins, and as you can see, the vines are sprawling all over the place. One of the things I enjoy most is going out to the garden and seeing the growth that has occurred overnight! Pumpkins that are growing need a lot of water and I made sure that they got all they needed during the few times that we haven’t had rain this past month. When watering, I avoided getting water on the leaves and I made sure to water early in the day or else the vines may succumb to powdery mildew. Eventually blossoms started forming and I became alarmed when I saw them falling off without forming any baby pumpkins. I thought the recent rain was knocking them off! But after some research, I learned to distinguish between male and female blossoms. The male blossoms fall off the vines after one day. Female blossoms have a little growth (ovary) at the base of the flower which will grow into a pumpkin IF the blossom gets pollinated by a bee. That’s one reason we have flowers in our garden-to attract the bees. I’ve even let some of my basil go to seed because so many bees are attracted to it. 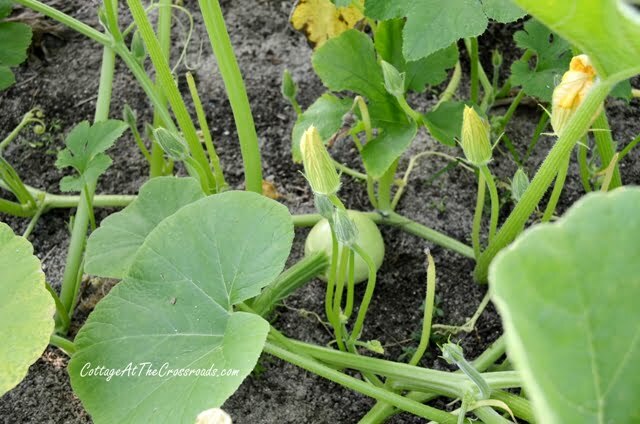 Well, the bees have been doing their work because we have pumpkins growing!!! This is the largest one and it’s about the size of a cantaloupe. Because we didn’t put down mulch, I am going to place some cardboard under each pumpkin that’s growing to keep them off the soil. And you would not believe how much this pumpkin grows overnight. I am astounded when I check on its daily progress. Because they are growing so rapidly, I need to fertilize again but this time I’ll use a liquid fertilizer that’s low in nitrogen. I haven’t counted how many pumpkins are growing, but I can tell that we definitely have 3 different types growing by the different shaped leaves and the skin of the baby pumpkins. Some have smooth skin and some ridges are forming on others. 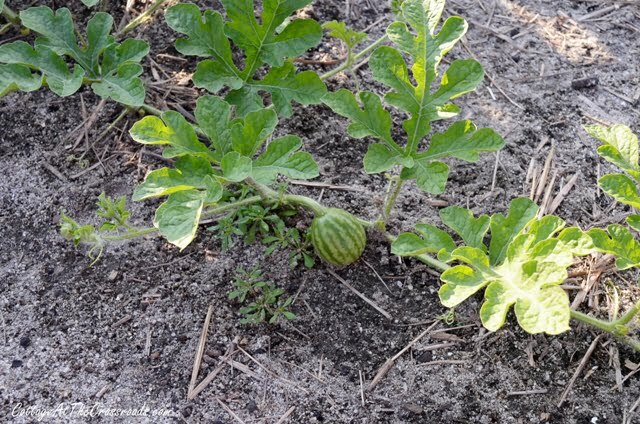 Amidst the pumpkin vines is a watermelon! A seed was in the compost that we put down. The pumpkins have a lot of growing yet to do. I predict that they won’t be ready to remove from the vine until mid October. Just like a watermelon, you judge when it’s ready to harvest by looking at the stem. When it starts shriveling and drying, the pumpkin is ready to come off the vine. 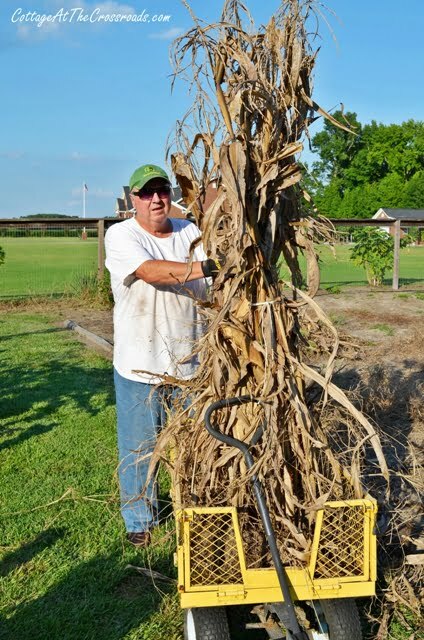 While we were out in the garden this weekend, Leo started pulling up the cornstalks. We tied some of them together. Here he’s hauling them out of the garden. We placed some here beside an outdoor bench. And some here beside this little fence that hides….well, nothing right now. It used to hide an oil tank. 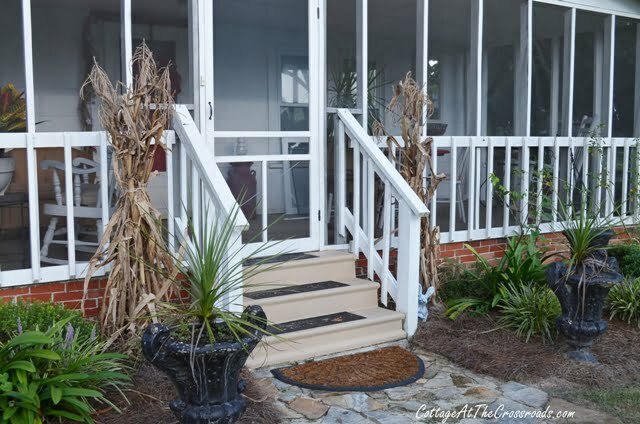 And last, some were placed here at the front of the house. Let the fall decorating begin! « Born of Persuasion Book Launch and Giveaway! I live in the central valley of California where it is very hot. I planted white pumpkin seeds from my grandsons ” Jack skellington” birthday party last year. Have them in a pot, but they seem to Wilt down from the sun every morning. Any suggestion? Quite autumnal! 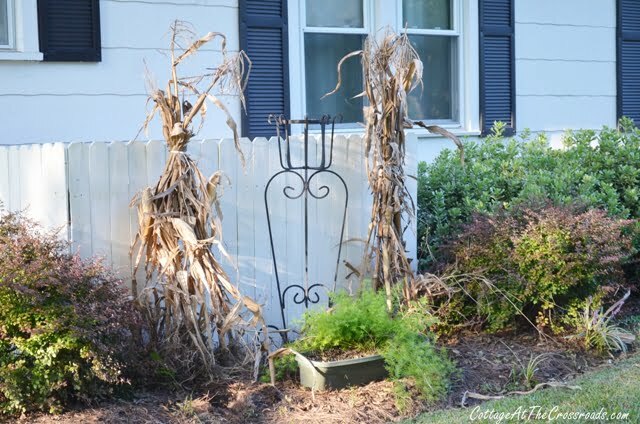 I love using the old cornstalks to decorate. I am so impressed with the pumpkins. We definitely do not have the room to grow them. I can imagine how exciting it is to go out and see the changes in your garden. Your garden is something very special. How cool Jane. I love white pumpkins and there sure are a plenty here! 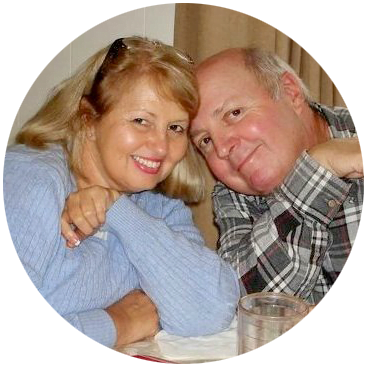 I found this site on hometalk and am very glad to see your garden Dianna and I live in Breckenridge, Tx we have a long growing season and plenty of area so I believe we will try this next year. It looks like you and your hubby spend a lot of time in the yard. Also I’m not sure we can grow the white pumpkins as it is very hot and dry here. 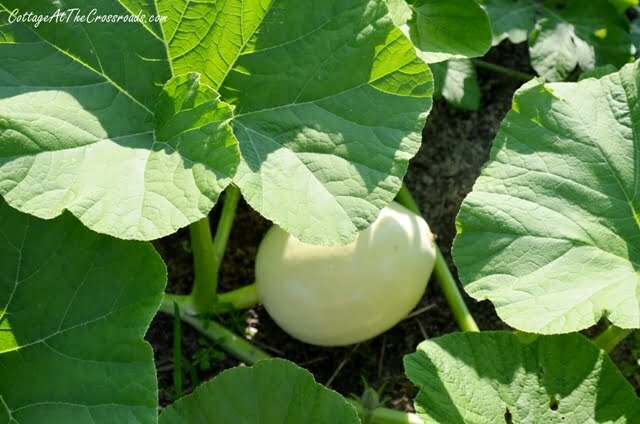 I have white pumpkin love Jane, I can’t wait to see them harvested! 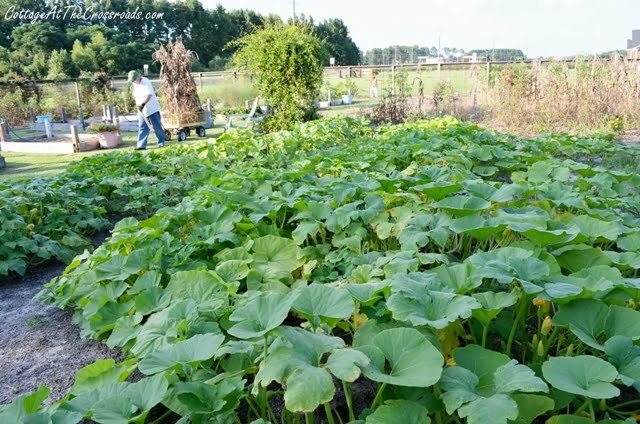 If you expand your pumpkin patch like your tomatoes, I can drive down and buy some from The Crossroads next year 🙂 Enjoy your Labor Day Weekend and don’t labor too hard in the garden! Oh, how wonderful to have white pumpkins! Maybe someday I’ll grow a garden. Hello, Love the enthuisiam with the white pumpkins! If you ever need any more I got them! Your blog is very appealing. My Fiance and I are in the process of setting up one for our family farm. Thanks for showing us your pumpkins. I am pinning this for my daughter and grandson. Bob had told them to put cardboard underneath the pumpkins and I don’t think they believed. I am telling them you and Leo are the experts. 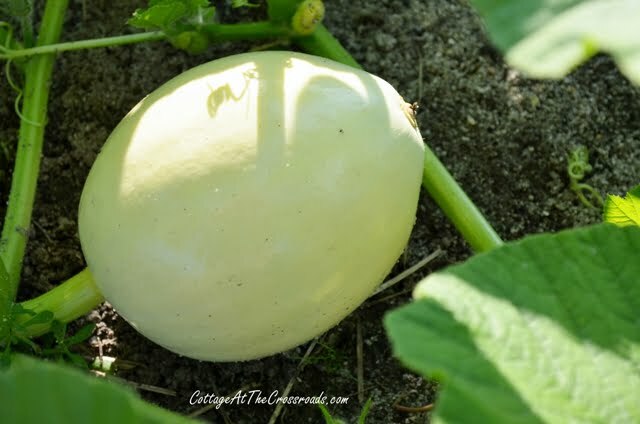 We planted watermelons in the same garden space as we planted gourds…the watermelon grew but never ripened…I found later from an experienced gardener that gourds and watermelon don’t mix…live and learn!! The pumpkins are so exciting.. 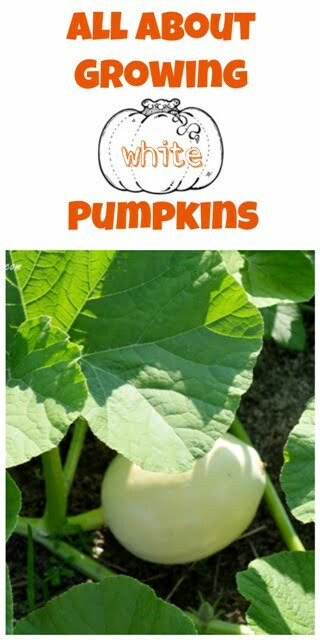 So very exciting, white pumpkins are so cool and they are hard to find. Your are taking off! Awesome, awesome pumpkin bed! I wish I had as large a space to dedicate…. I’m going to start re-figuring things for next year. We have had one bumper pumpkin harvest here in the past, but it was volunteer oranges growing in the compost heap! This is full of great information that I didn’t know about! We recently moved to an acreage and next year I plan to plant pumpkins and will keep your information in mind. I love white pumpkins, too. I’m so jealous of your white pumpkin patch! Dropping by from Met Monday. Hope you’ll come see my grandson’s playroom. 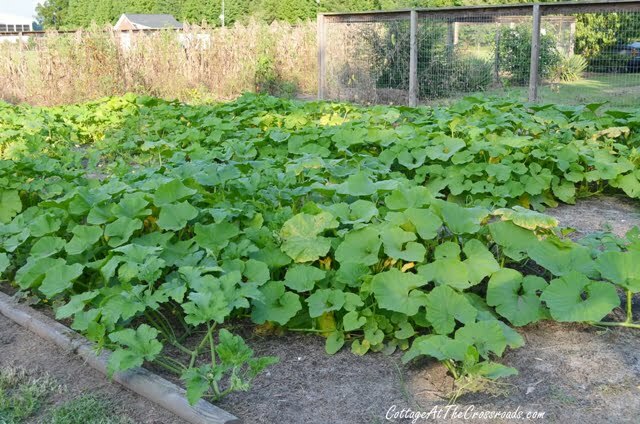 Love seeing your pumpkin patch ! Can’t wait to see how many pumpkins you get !